We live in a time of environmental degradation – and a time in which China’s environmental journalists can show off their talents. But now the state has decided to tackle pollution, and we have entered a golden age for environmental journalism. The influence of China’s traditional media has waned in recent years, with journalists losing passion for their profession. But China’s environmental writers have bucked this trend and achieved increasing prominence – as we see in the winning journalists and stories at the 6th China Environmental Press Awards held on July 14. These annual awards were launched by chinadialogue and The Guardian in 2010, with the aim to encourage environmental journalism and promote protection of natural resources. With this year's ceremony, the sixth so far, a total of 93 journalists and outlets have been recognised. Best journalist award went to Chen Jie, a photojournalist with the Beijing News. Last year he resigned as the paper’s photo editor to return to frontline photojournalism. In 2014 he completed a series of seven pieces on the environment. One of these,'Death of the Desert', an exclusive on Tengger desert pollution, prompted Chinese president Xi Jinping to issue three separate memos, with the State Council forming an investigation team resulting in dozens of officials in Inner Mongolia losing their jobs or being punished. The case was also mentioned in the March 2015 work report of the National People’s Political Consultative Conference. Chen’s work in 2014 showed the value of a journalist’s work: you won’t earn much, but you can change the world. The judges named Chen journalist of the year – and as one of those judges I have to admit it’s not just his excellent reporting that means he can change the world. Another important factor is that he happens to be reporting at the right time. If China’s new leadership wasn’t now taking environmental issues more seriously, if the president hadn’t written those three memos, if Chen's piece had been written five years earlier – then, as is so often the case when pollution is exposed, maybe nothing would have changed. But the state brought its full power to bear on those polluting the Tengger desert, and in doing so highlighted the work of one other young journalist. In her second year since graduating from journalism school, three of Kong Lingyu’s environmental reports appeared on the cover of Caixin Weekly, with her 'Pollution in Plain Sight' article enjoying particular prominence. After the exposure of pollution in the Tengger desert, Kong and her editor took a closer look at its causes. She spent two months visiting over 30 evaporation pits across three provinces and exposing the underlying logic – that 'environmental capacity' in the west of China negates pollution, the subsequent emergence of the ‘zero pollution’ myth, and the use of evaporation pits as a ‘zero-pollution’ technique to make company emissions appear legal. The article led to a Ministry of Environmental Protection investigation, reorganisations and reforms in local government, and, ultimately, banning of evaporation pits. Kong Lingyu was awarded the Young Journalist prize, which rewards those with less than three years of experience in the field. This prize was established on the suggestion of Yuen-ying Chan, a member of the judging panel and a professor at Hong Kong University. 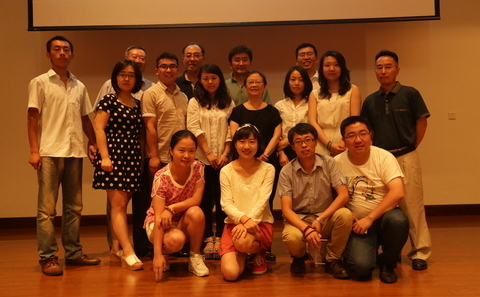 Previous prize-winners have been Caixin’s Liu Hongqiao and Wang Tao of Southern Weekly. The appointment of Xi Jinping and Li Keqiang as president and premier respectively has led to China intensifying efforts to clean up pollution, with more active policies now in place on air and water pollution. At the start of the year a new and tougher-than-ever revision of the Environmental Protection Law came into force, with environmental authorities handed stronger powers. There has also been more progress on emissions and dealing with climate change. Thousands of polluting factories around the country have been shut down – despite the impact on economic growth and the tens of thousands of job losses. With environmental issues taken more seriously than ever before, much quality environmental reporting started not just to bloom but also bear fruit, by bringing about solutions. Zhong Meilan’s pieces on Lugu Lake for the Sichuan Daily are one example: the government of Yanyuan county in Sichuan planned to introduce motorboats on Lugu lake to help tourism – but locals weren’t convinced. Zhong Meilan visited to find out why the government wanted the new boats, whether they would cause pollution, what the locals thought, and if the boats would damage the local Mosuo culture. Sustained coverage and investigations, along with simultaneous publication across both new and traditional media, created wave after wave of public comment. The Yanyuan government was forced to shelve its plans and the environment of Lugu lake and the rights of vulnerable locals were protected. For this reason, Zhong Meilan and the Sichuan Daily win the Public Service Award. This year saw prizes go to a more diverse range of outlets – from established media such as Caixin, the Southern Weekly and Caijing, to the traditional official outlets such as Xinhua and the China Youth Daily, and then on to new outlets such as Thepaper.cn. Happily, the number of local outlets – Sichuan Daily, Hainan Daily, the Shandong Evening Times – receiving prizes has jumped, reflecting a better standard of environmental reporting by local news outlets. Similarly, awards were given to a variety of types of pieces – long investigative pieces, breaking news reports, photojournalism, interviews, and, most encouraging of all, the multimedia climate change report from Thepaper.cn, 'Climate Migrants'. Climate change is often perceived as a ‘lofty’ subject, not one easily connected to the everyday lives of the people. But this set of reports covered migration issues arising from climate change in Ningxia province, using pictures, video, audio, text and statistics. The audience did not just read about climate change – they saw it, they heard it, and they felt it. Climate change stopped being a theoretical issue and became vivid: a story of people and their pain and their fate, told with images, with sounds, with flavour and warmth. So this new award, for the best climate report, goes to Shi Yi, Xu Xiaolin and their colleagues at Thepaper.cn, for her piece. For over a decade I have been observing and reporting on China’s environment. I have seen how, over that period, our environment has continued to worsen and our environmental journalists have continued to do their best. But only in the last two or three years has their work been paid more attention, only now are the problems they report on more likely to be resolved. As the state has reconsidered its stance that highly-polluting GDP growth and breakneck urbanisation should be the preferred path, we enter a golden age of environmental journalism. And I am sure that their work will help China enter a new epoch of a cleaner environment and greener development. Liu Jianqiang is former Beijing editor of chinadialogue. Before joining chinadialogue, Liu was a senior investigative reporter with Southern Weekend, China's most influential investigative newspaper. Environmentalist Liu Futang found guilty of "illegal business activities"
Accused Chinese environmental campaigner Liu Futang has received a suspended three-year prison sentence and a 17,000-yuan fine.